Ramadan is a month of blessings, a month of mercy, a month of forgiveness, but most importantly, it is the month of the Qur’an. As Muslims, we often associate Ramadan primarily with fasting or feeding the poor. But God Almighty, with His infinite wisdom, makes mention of His Book before anything else. In this verse, God Almighty begins by describing Ramadan. And He does so beautifully by taking us back into history and back to the basics of Islam. What is Ramadan? God tells us that it is the month in which the Qur’an was revealed. And what is the Qur’an? The Qur’an, the book of God, a glorious miracle sent to the nation of Prophet Muhammad, and as God informs us here, the reason for this revelation – is as a ‘guidance’ for all of mankind. Over 1400 years old, the Qur’an is magnificently still unparalleled to this day. So through this verse, we immediately learn of the importance that God has given this great month, the month of the Qur’an. Recitation of the Qur’an is a beautiful act of worship and one for which the rewards are limitless. Our beloved Prophet Muhammad (peace and blessings be upon him) told us that there is a reward for each letter of the Qur’an that is recited. And that reward will be multiplied by ten. So, just imagine, how amazing and rewarding it would be to read a chapter of the Qur’an, or perhaps 5 chapters, or 10, or perhaps even the whole Qur’an! And in Ramadan, this reward is only multiplied further! In fact, the Companions of the Prophet and scholars of the past would devote almost all of their time in Ramadan solely to recitation of the Qur’an. They would recite the Qur’an in their prayer and out of it, especially during the late night prayers known as ‘Qiyaam’. And indeed, it is not enough to simply recite the Qur’an, but to recite it with meaning and understanding and through pondering over its verses. So that we can then emulate the characteristics of those praised in the Qur’an and take heed from those disgraced. Indeed, the long fasts of Ramadan are a means of softening and training our hearts to become more receptive and humble to the recitation of the Qur’an, so that the message of Islam truly penetrates our hearts and fills our beings. So, dear brothers and sisters, strive this Ramadan to make the Qur’an your companion, to recite it day and night, to reflect and ponder upon it, to refresh your understanding of Islam through it, and to re-connect your hearts with God Almighty. We ask God Almighty to bless us and shower upon us all understanding of His Book, to grant us the ability to discover and learn from the Qur’an in ways that are beyond our imagination, to lighten up our hearts and faces with the light of the Qur’an, to enliven our lives and revive our hearts with the Qur’an, and to make us true Companions of the Qur’an in this world and the Hereafter. Download a translation of the Qur’an onto your phone so that you can read it with meaning wherever you are. Follow the study of the Qur’an in a dedicated Qur’an class with a teacher and group of students. You can also follow an online class or YouTube series. There are vast resources out there! 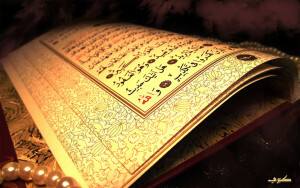 Recite the Qur’an, following after the recitation of a well-known Qur’an reciter. This way, you will pick up and learn the correct pronunciation of the words. Listen to the recitation of the Qur’an as often as you can. Whilst cooking, driving, cleaning, idly sitting, etc. Take steps to learn the language of the Qur’an so that you can fully comprehend and understand its vast and profoundly deep meaning.